Everyone told Margarita that her daughter looked like Boo. And that’s how she came up with the idea of making a Boo costume! Her daughter was terrified at first (as many little ones are by infant toddler Halloween costumes) but quickly warmed up to the cute homemade costume. 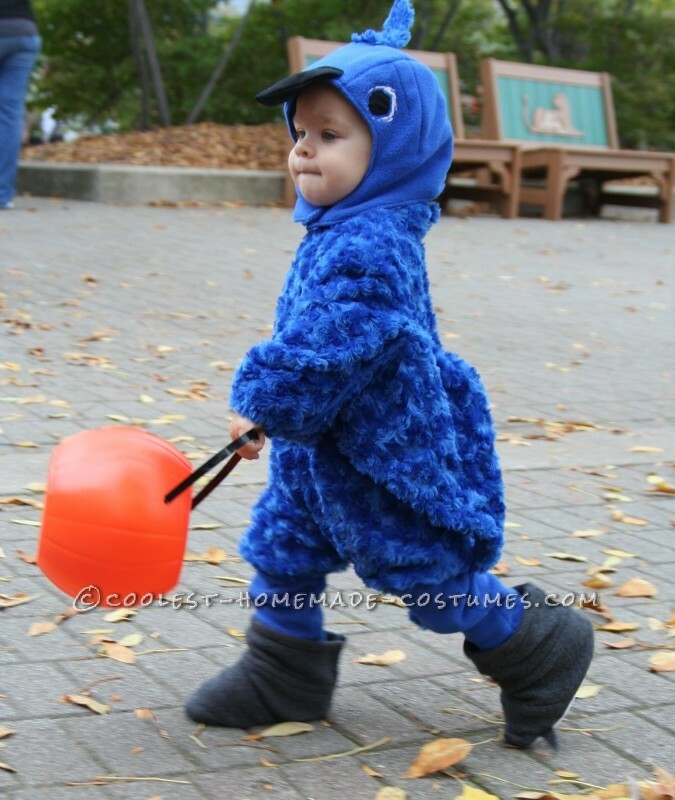 She spent Halloween posing for photos and walking a whole six blocks together with Mom/Mike and Dad/Sully. Shanessa put this Boots costume together in “no time at all”. Most impressive is that it was less than $20 by buying only two fleece sleepers from Walmart. Shanessa herself was Dora, using the backpack as a diaper holder. 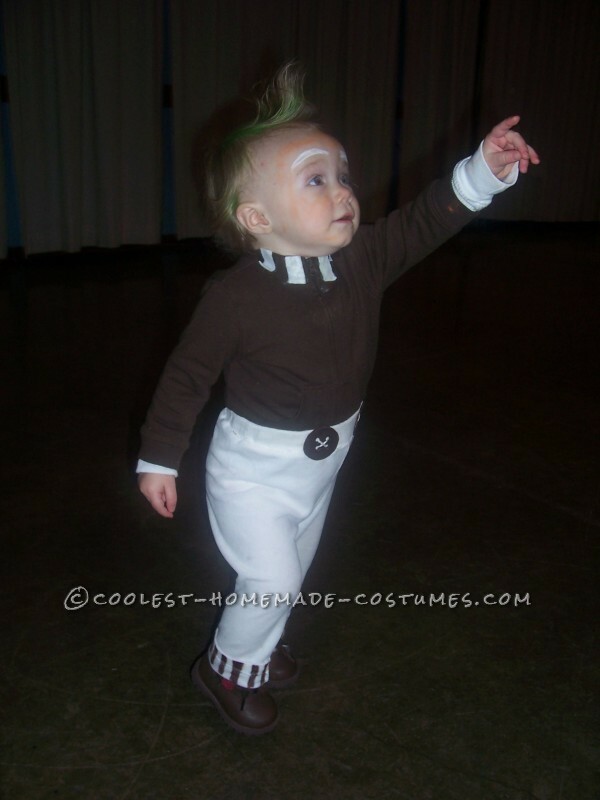 This adorable Oompa Loompa costume got lots of compliments and took Tiff only several hours to make. One important tip she shares, is when coloring the hair green, wet the hair and leave some soap in it so it stands. 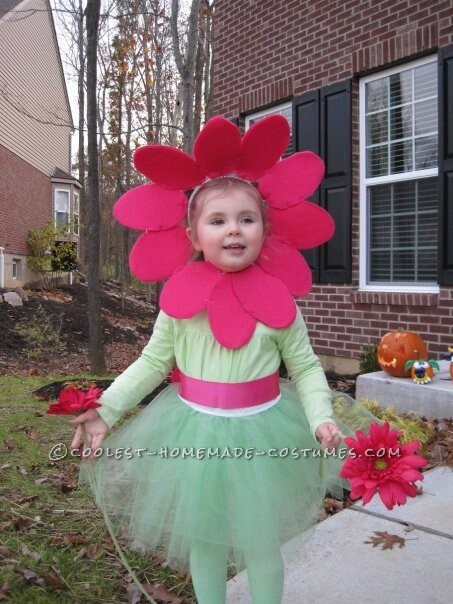 The most challenging part of this cute flower costume were the petals. To make them, Wendy cut out petal shapes from hot pink felt, put a piece of wire through each and then wired each petal to a headband. Michelle didn’t let the rough times of the 2009 recession and the layoff of her husband hold her back and using items found around the house, put together her “best creation yet”. 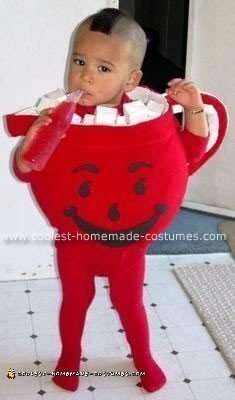 Check out her Toddler Kool Aid Man costume. 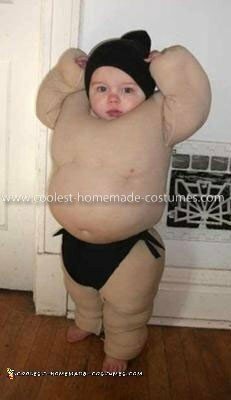 The idea of a sumo wrestler dawned upon Christina as she was watching her son walking around in his diaper one day (“He was still pretty chunky back then..”). Aside from the quilt filling, a neat idea for the Sumo hair bun, was to use a pincushion under the black skull cap, tied off with a hair band. 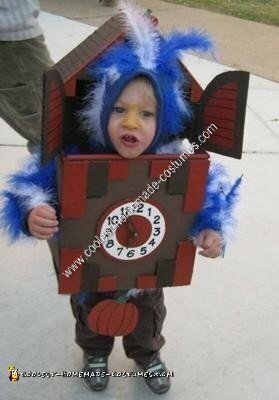 Josh’s two-year old son’s obsession with Cuckoo clocks was the inspiration for this costume (which one a prize in our 2010 Costume Contest). 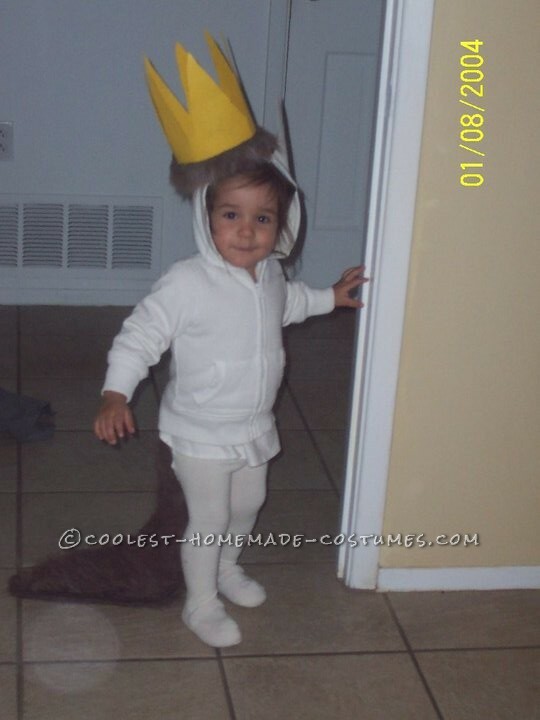 Josh didn’t find any such costumes online, so he decided to come up with the original idea himself and provides a detailed writeup explaining how he turned his son into a Cuckoo bird walking around in a Cuckoo clock. 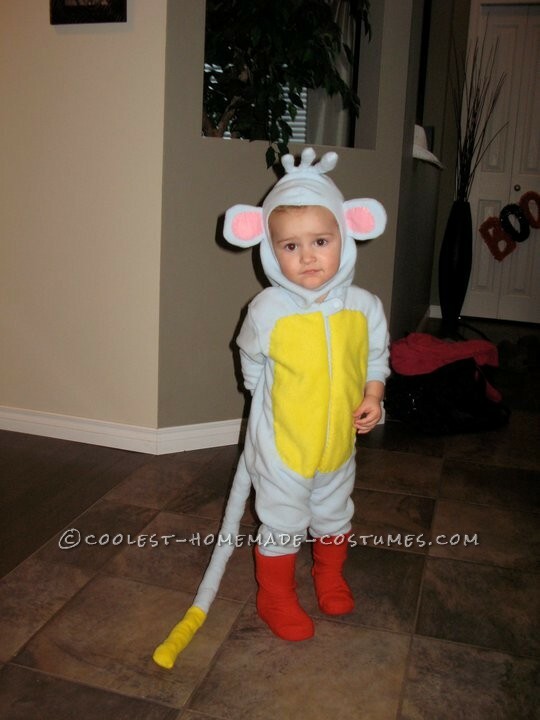 Megan’s daughter is “loud and dramatic”, so a Max costume was a perfect fit for her. The costume is all hot glue and completely no-sew and won the Best Storybook Character prize at a local costume contest. 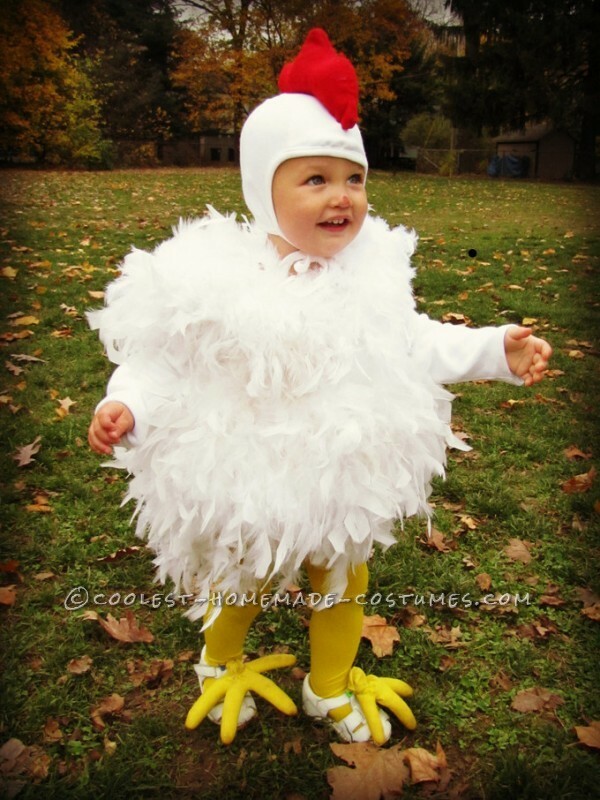 Karla created this Toddler Chicken costume for her eldest daughter. Seven years later her baby sister (in the picture) made great use of it. The yellow chicken feet are actually yellow kitchen gloves and “there’s nothing like an 18-month old toddler waddling around like a little chicken,” recalls Karla.